San Francisco and London are squeezing tiny recreational spaces into busy urban areas. 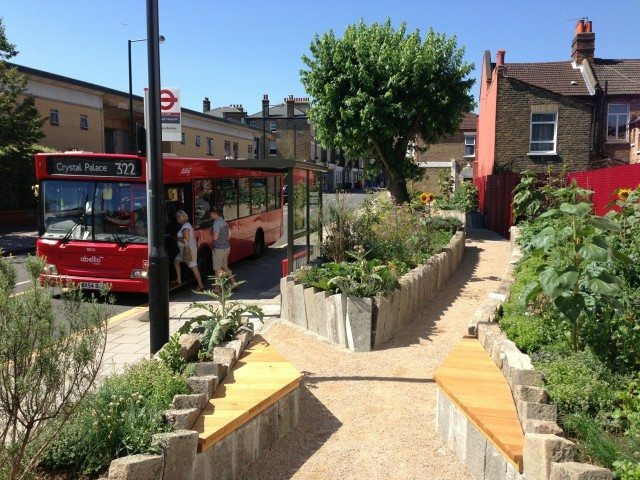 Landor Road, home to one of London’s 100 new pocket parks. In August, San Francisco unveiled the 1 Burrows Street Pocket Park. Once a little-used cul-de-sac, the site was repurposed as a streetside public space complete with furniture, an information kiosk, a footbridge, and vegetation. Pocket parks are becoming more popular around the world as cities look for ways to carve recreational space into the urban landscape. They comprise small public spaces built on existing infrastructure such as sidewalks, traffic islands, and curb extensions—and they’re perfect for urban areas lacking greenery and leisure space. The City of San Francisco encourages community groups to create their own pocket parks (with City approval, naturally) and provides design guidelines on its website. Recommended pocket park amenities include seating areas, playground equipment, community gardens, educational displays, and community bulletin boards. And the City points out that pocket parks can be effective at retaining stormwater, allowing it to seep into the earth instead of flooding roadways or washing oil and other street filth into the sewer system. The belief in pocket parks isn’t restricted to Californian cities known for feel-good public space initiatives. New York City has been into pocket parks since the 1960s. London, as part of Mayor Boris Johnson’s public-space improvement program, has spent £2 million creating 100 pocket parks in the British capital. And in Indianapolis (perhaps not quite as major a metropolis as the others), a conservation group has been building pocket parks for years, squeezing them into residential streets and replacing derelict houses and vacant lots. Toronto has a few slivers of green space wedged alongside city streets. Most of them are (as is the case with New York City’s pocket parks) situated on privately owned public spaces. We fall short of San Francisco and London—cities pursuing urban planning strategies of which tiny patches of enjoyable public space are an important part. But as our city grows and public space becomes more and more precious, pocket parks may become increasingly vital.